PictureReady creates a real time architecture for high speed editorial of live feeds or transfer from linear sources, by facilitating real time replay and editing of content, â€˜as it is recordedâ€™. PictureReady forms the record channel, whilst Final Cut Pro or Premiere Pro is your editorial station. You can add as many PictureReady record systems as you like, provided you have sufficient bandwidth available on your storage. 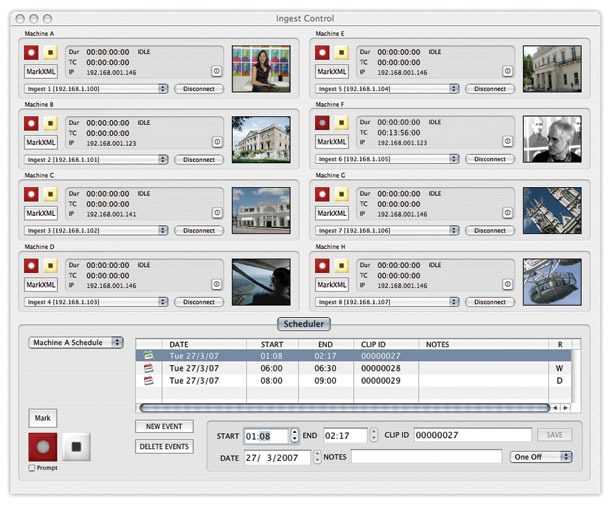 For centralised control of mutiple PictureReady systems, take a look at Sienna IngestControl which controls up to 15 channels on a single screen or the free 4 channel PictureReady Network Remote. When capturing live sources, you never get a second chance, so reliability of capture and appropriate redundancy is critically important. 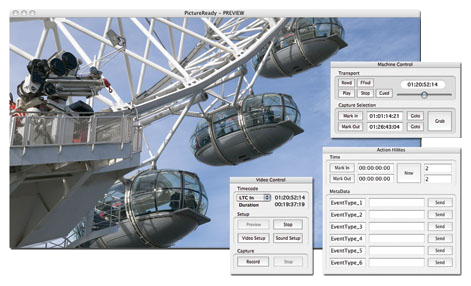 Gallery invented the process of recording into live - editable movies with PictureReady's first release in 2004. Whilst other companies have since followed our lead, none have delivered the same reliability of capture, proven time and time again - at high profile events such as the Torino Olympics in 2006 (with NHK), Beiing in 2008, London 2012 and Rio 2016 (with Televisa). PictureReady has a 1000 frame RAM buffer to store incoming video frames securely allowing plenty of slack in the storage architecture without losing a single frame. Redundancy is another critical factor, and as such, each PictureReady channel runs on a dedicated low cost computer, to avoid mass outages with hardware failure. Suprisingly, this redundant approach is *less* expensive than other systems which try to cram up to 8 channels on a single very expensive computer and a single video card, with the inevitable total outage when the hardware fails. PictureReady records via Video devices such as AJA, BlackMagic Design and Matrox directly into QuickTime movies, which can be edited during capture with compatible editors including Adobe Premiere Pro and FinalCut Pro. PictureReady can capture SD, HD and UHD with appropriate hardware, along with up to 16 channels of audio. Recordings are timestamped frame accurately from a choice of timecode sources including embedded RP188 timecode, audio LTC or 9-pin timecode. Most PictureReady systems are based on MacMini dual i7 CPUs, although in many cases a dual i5 Mac Mini can suffice.